Dr. Cesar Zamora, and his highly trained and experienced team of dental professionals, aim to help their patients smile with confidence. Dr. Zamora offers a variety of dentistry services from his Mission District based office in San Francisco, CA. Dr. Zamora is considered one of the best dentists catering to patients in the Mission District and The Castro. Some of the treatments available include: Cosmetic Dentistry, Teeth Whitening, Dental Implants, Clear Correct Consultations, Periodontics, and Root Canals. Dr. Zamora welcomes new patients for full exams and is able to service dental emergencies. Dr. Zamora is certified by the California Dental Board. He completed the International Dental Program at the University of La Salle in Mexico in 2012, and passed both national and state board exams soon after. 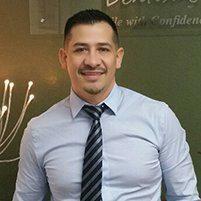 Dr. Zamora opened his own practice in 2015, however, he has been practicing dentistry for over 15 years. He regularly attends dental lectures, dentistry meetings, and dental conventions to stay informed of new dentistry techniques to provide excellent dental care to all patients. Dr. Zamora was born in Colombia and now makes his home in San Francisco, CA. He stays active in the outdoors and enjoys going to the movies and traveling. Dr. Zamora is currently welcoming new patients. He accepts most major forms of insurance.